Beginner or expert pianist with the aim of advancing their piano playing skills can polish themselves with this digital piano investment! The Alesis Coda Pro 88-Key Digital Piano is an instrument that closely replicates authentic touch, feel and response of a grand piano. Not only packed with rich sound and features for versatile performance, but this piano is packed with other benefits for pianists including two main concerns; portability and affordability. This piano includes a full size keyboard and thus is a superb choice for young piano students, schools, churches, stage and studios. Despite of being packed with features, it is easy to start and simple to use whereas at the same time let pianists to be as creative as they want with their music. Thus this digital piano is a right choice for anyone from beginner to a pro piano player. Impressive Portability: Stylishly designed with a compact structure that makes it a good buy for anyone looking for a portable package. With 59” x 19” x 9” size and weight only 27 pounds, it is perfectly suitable for any kind of setting whether you need a piano for your home or studio or at school or church. It is a great value package that is easy to set up as well as easy to move around. Full Keyboard: It features a full sized keyboard with 88 hammer action velocity sensitive keys that give you complete piano range coverage for versatile and richer sound with authentic playability experience. With this range of keys, you can play any piece from simple to complex piano music with ease while experiencing sensitivity of keys for different sound effects. Its hammer action keyboard gives you idealistic feel under your fingers and thus you will be able to find it more suitable for its playability. Grand Sound Features: Apart from its structure and design, there is more to enjoy with Alesis Coda Pro and those features are related to its sound. Styles: Practicing rhythms and melodies gets really interesting with its on board metronome and 50 accompaniment styles including Slow Rock, Jazz Pub and others. Built-in Voices: With these different styles and 20 built-in voices (including grand piano, electric piano, harpsichord, organs etc. ), a pianist can give additional beauty to his practice and performances. Layer and Split Features: These sounds and voices can be layered or used individually with layer or split option to give a completely powered piano music. Sound Source: All the instrument sounds are from industry leading AIR and SONiVOX software developers. All these sound features make it a versatile instrument packed with all the ideal elements. 64 Polyphony (max): Complex songs and notes can be heard with its 64 voice polyphony. 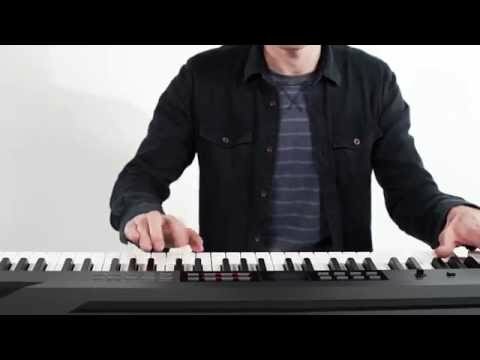 Thus you can opt for any style of piano sound with this digital keyboard. With this feature, you can keep more notes while pressing the pedal. Preset Songs: This digital instrument also includes 60 preset songs with the aid of which a pianist can practice and improve piano playing skills. These songs are from a variety of genres and thus you can practice different styles of music including everything from rock to blues to pop etc. Record Mode: Not only you get to practice piano songs but you can also record your own performances with User Record Mode. Built-in Speakers: Piano has loud built-in speakers that gives you sufficient sound for listening to your practice and performance. Thus, it keeps you from the trouble of connecting outboard amps that many keyboards need in order to give you playability and sound. You can begin playing this instrument, the moment you receive it with its built-in sound speaker system. Sound Effects: This Alesis Coda Pro features sound effects of different types including reverb, equalizer and chorus. With the aid of these functions, pianist can add versatility to his piano music and can make sound much deeper, richer and expressive. Connectivity: You can connect your piano with a computer system through its USB MIDI port that offers you complete control over instrument plug-ins and software. With Aux input, you can connect external sound sources such as drum machines and with its Aux output, you can connect recorders, mixers etc. Headphones: It also features sustain pedal input along with two ¼” headphone outputs so you can enjoy quiet practicing. Music Stand: Coda Pro could be bundled with its music stand that makes handling of music sheet really simple. Connecting stand to the piano is super easy, you just need to connect a single cable to piano and add pedals. These stands are finished with genuine wood and thus would add beauty to any interior setting. Accessories included: The piano comes with an external 12V power adaptor, sustain pedal and a user manual. Full sized hammer action velocity sensitive keyboard gives authentic piano playing experience. Light weight and portable instrument. Impressive connectivity with USB MIDI input/output ports. Interesting sound features and quality sampling from AIR and SONiVOX developers. Voice layering and splitting features gives you flexibility and versatility. Speakers system built-in so you can instantly begin using the piano. Piano stand has an additional cost. Speakers are not really loud. Voices are limited and you can find other keyboards with a wider range. 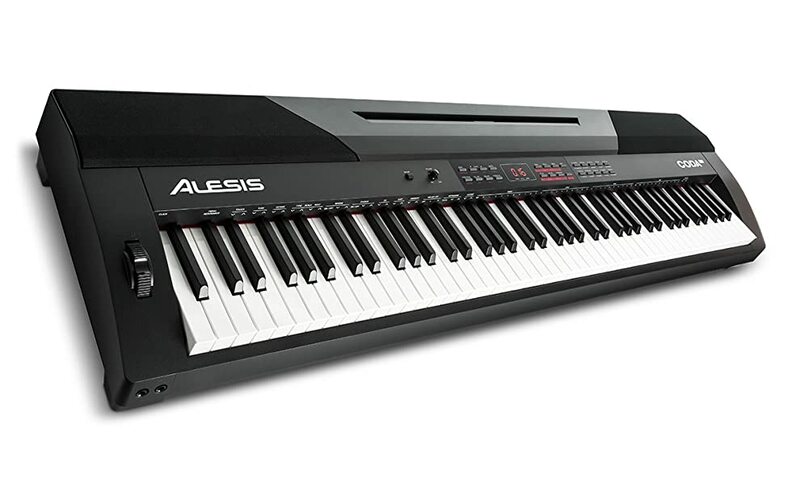 The Alesis Coda Pro can be termed as one of the best entry level pianos similar to Yamaha P45. This product could be a good choice for all the piano learners, teachers, live performers and other pianists. It gives you plenty of options and effects to test and try your creativity and passion with piano music.